I feel you girl: SO MUCH! When I first injured my foot, I was like: ok, Chicago is out (Grandma for you), but the race that really counts is Boston (Trials for you - I know, quite different ;)) and, if I had to get injured, better now than before Boston. I will cross-train religiously for 5 weeks and come back stronger and ready to kill every workout and conquer the world! Well, 5 weeks have passed, but my foot still feels weird, so I decided to wait one more week before attempting my first run. But what if in one week my foot still feel the same? What if I have to wait more than one week? I seriously CANNOT take this swimming thing any longer (and I grew up as a swimmer, so imagine). I want to RUN. Period. And I feel you about the training part, too. My coach sent me my training plan for September: one short easy run after the other. Wait, weren't we supposed to kill one workout after the other and conquer the world right after this injury?? Sometimes I feel this is the "price I have to pay" for the flawless season I had last winter/spring. I trained smartly, I was feeling stronger than ever, and I smashed my marathon goals. I have to accept that not every season will be like that, unfortunately, and that I have to be grateful for the last two great marathons that I ran. Glad you will be going on vacation soon: it will help you so much to take your mind off this. Sorry for the poem I wrote, but misery loves company, and I can seriously relate to every single word you wrote. Hang in there, Teal. It's so hard to simultaneously try to bump up the miles while holding back and being smart. I freaked out last season when (in order to come back slowly from my stress reaction) I had to take more time to build than planned. Instead of coming back as I'd planned and having a nice gradual 2-month buildup before the "real" training started, I basically had to hold myself back and do walk-runs, then little 3-milers, THEN finally could start back-to-back days and finally after a few weeks of that, the workouts. I was so stressed that I wouldn't have enough time to get my base built before training started but you know what? It all worked out. My base was smaller and my training was fewer miles as a result, but I was so darn happy to be out there running that I appreciated (and had a renewed love for) every run, every hard workout that I got to do. The result? A new PR on the smallest base and training cycle that I'd run to date. It can be done. The patience you are having to exert now will pay off. I promise. Hope you are able to get away and enjoy vacation, I'm sure that will work wonders! Thanks for keeping it real and as always you're inspiring! Injuries are so tough!! Especially when you have big goals. I'm with the other commenters: it's okay- even necessary- to sometimes process and spill how you feel. Healthy runners are always super-quick to tell you a lot of things you know are TRUE, but not necessarily REAL... ('it's just a bump in the road, you'll come back stronger', etc. etc. ), but I guarantee every runner who gets injured experiences these feelings. Some might just not be as honest about it. I SO feel ya- after my 9 month layoff last summer/fall, starting from zero, and then having some subsequent injuries that kept tripping me up... well, it's taken nearly 18 months to get back to my previous level of fitness. 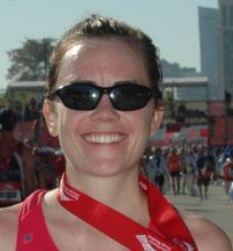 My goal to Boston-qualify keeps getting pushed back to "next year" - and it hurts. Best of wishes to you in your comeback...your support system sounds great... I know you will come back with more drive than ever! Thanks!! Looks like it's just for new qualifiers but I'll share it with people who might be interested. Seems like a cool opportunity!